Two seminars planned this summer by the UC Davis Veterinary Medical Teaching Hospital (VMTH) will provide horse owners with the latest information about equine health. The U.S. Food and Drug Administration (FDA) has approved QUEST® PLUS Gel from Zoetis for use in breeding, pregnant and lactating mares. Anhidrosis is the scientific name for a dysfunction in the ability to sweat. 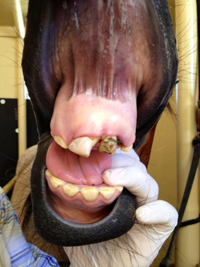 Equine anhidrosis has been recognized for many years, but it’s exact cause is still not known. There does not seem to be any predilection for a particular horse breed, age or coat color, and both male and female horses are affected. Some horses may not be able to sweat at all, and others only sweat in some locations. Well, for starters, it just looks bad. Secondly, there is a normal tooth misplaced, a terribly diseased tooth hanging on for dear life and another gone altogether. If pictures could smell, this one would. The black tooth smelled as bad as it looked. I'm sure you've all heard the old saying, "If you don't like the weather in Texas, just wait a few minutes and it'll change." Well, over the last few weeks that saying has never been truer. From a horseman's standpoint, the dramatic shifts in temperature, wind speed, pollen count and humidity have been showing up in a variety of different ailments. Horses tend to have times of the year when respiratory infections are more common, other times runny eyes and noses flare up because of allergens. Technology touches every part of our lives.It cools our houses, helps us run faster, gets us better fuel mileage, and ensures there is always a song we like on the radio. When technology is applied to horses, the best application in a long time has been the use of MRI in the diagnosis and treatment of lameness.